It’s hard to believe that I had never listened to this album before. 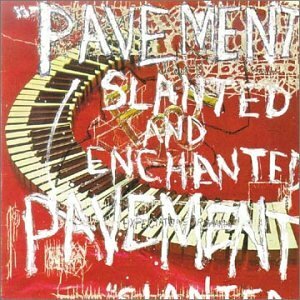 Honestly, I had never truly listened to Pavement before this. Considering Pavement has influenced numerous bands that are making music today, this is something that I kind of needed to hear. Now I know that I’m in the minority, but I didn’t enjoy the album too much. Keep in mind, I’m listening with a 2011 mindset. I’ve grown used to the large number of bands that I hear who are obviously trying to emulate Pavement, and I’ve become jaded. It’s unfortunate, but I can’t force myself to like an album. Had I been around—and an avid music listener—in 1991, when this album came out, I probably would have been all over it. It has many of the things that I like in music; things like emotional lyrics, solid instrumentation, passionate delivery, and even goofy song titles (Trigger Cut/Wounded-Kite at :17, anybody?) I just can’t seem to place myself in the shoes of an early nineties listener, someone who had never heard anything quite like this before. Don’t get me wrong, I see the appeal of Slanted and Enchanted. I understand why people love this album and band. It’s just not for me, unfortunately. Pavement has a sound too much like their generic imitators. A sound that I’m not a fan of because of these imitators. Now that’s a way to kick off a blog. Rip on a cherished indie band. This gon’ be interesting. I guess I agree for different reasons. It sounds like you don’t like it, but you respect it. I don’t think I even respect it.